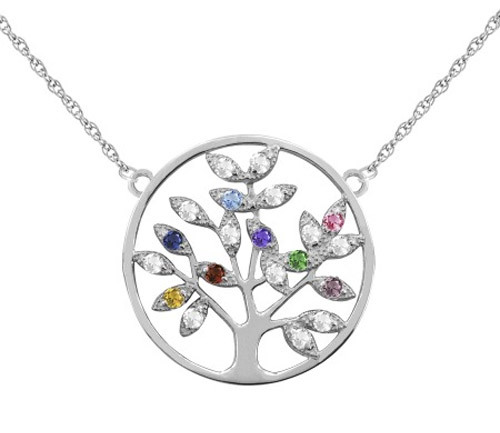 If you are searching for a truly unique and wonderful gift for the special woman in your life, the personalized gemstone tree of life necklace in white gold from Apples of Gold Jewelry is the perfect choice. The necklace, which is available in your choice of 10K or 14K white gold, features a small tree within a circle with branches reaching into the circle in different directions. The branches hold beautiful gemstones, which you are able to choose up to 9 to personalize the necklace to your liking. Choose from genuine or simulated gemstones, each round cut and measuring 1.25mm in size. Make this necklace a birthstone necklace or a necklace to symbolize special occasions. The gemstones will appear on the tree staggered in varying order. The overall size of the necklace is 0.65 inches round. We guarantee our Personalized Gemstone Tree of Life Necklace, White Gold to be high quality, authentic jewelry, as described above.